I love your blog, I read it everyday. I am a stay at home Mom with two kids. I was wondering if you can write about Minimalist Wardrobe for Kids. My kids have so much clothes, I don’t know how to keep up with them. My mother in law buys them clothes all the time, non-stop. The clothes are driving me crazy. Keep up the great job, I can’t get enough of your blog, I’ve recommend your sites to my family and friends too. Now first up I would like to say the I would not consider myself a minimalist by any stretch of the imagination although I agree in principle with the minimalist movement. I prefer to think that at best I am only at the start of that journey but like the feel of the trip so far. That being said I will be happy to give my take on Angelina’s problem. Now I am going to be quite blunt here because I think there is no other way around this and I think in the long run Angelina will agree with what I am about to say. Her own comment/request hinted at the real problem here and I think she just needs a little advice on how to handle it tactfully. I am not always the most tactful person though I must admit but I will give it my best shot. Angelina’s problem isn’t her children and it isn’t their wardrobe the problem is that her Mother-in-law doesn’t know when enough is enough. She means well I am sure but excess is not only bad for the environment but it is also not a good lesson to teach children. Unfortunately, the only solution to this problem is to make a request of the MIL to cut back on this unnecessary supply of clothing. Now I don’t know how close their relationship is but, no matter what, she cannot idly stand by and let this continue. We often make the mistake of sacrificing our own needs for the needs of others but when the other person’s actions are having a negative effect on more than just ourselves (although that really is enough in some cases) then it is time to stand up for what you believe in. There clearly needs to be a conversation between Angelina and her MIL and perhaps it should go like this. Lead in with a compliment…“‘MIL you provide such lovely clothes for the children, they are always so neatly dressed and I can see you love them dearly”…. Then comes the BUT… “but the quantity of clothes you provide for the kids is just too much. There is no way they will ever get the full value out of each item when there are so many to choose from and it is such a waste. This excess is not a good lesson to teach the children and not good for the environment either”. You may want to add something here about your goal to cut down on clutter in your home. At no point in this conversation have any demands been made. There is a good balance of gratitude and a clear explanation of the concerns both for Angelina’s thoughts on the waste involved and the feelings of the MIL. I think this formula can be adapted to fit with a number of situations to request people to cut back on the excess they provide you against your personal requirements. I have made a page of this called Request Formula in case you would like to reference it for future issues. I am always open to suggestion on improvement so if you think I need to add something to it please feel free to let me know. Well Angelina, I hope this was helpful to you and I look forward to hearing how things went for you with your mother-in-law. 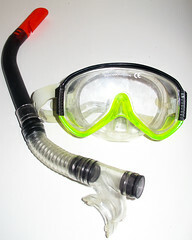 We bought this set of snorkel gear when on vacation once. We should have left them at the beach for someone else to take as they have never been used since. I gave them to the son of a friend because they go to the beach all the time. Angelina might also note during the conversation how the money might be better spent (if the MIL still feels the need to throw money at the kids). Things like contributions to college funds, individual stocks in each child’s name (kids get a kick out of owning a slice of Disney or Coca-Cola), season passes to a nearby amusement park, and movie tickets are all great ways to give to the children without creating a clutter nightmare. I like your ideas especially the college fund. I hope Angeina reads this comment. First of all thank you very much for writing about this topic. I’ll be honest with all of you and everyone who is about to read this including my DH 🙂 I have in the past asked my dear MIL to stop shopping for my kids. I really do appreciate all the clothing, 12 pairs of shoes and ten thousand toys that she buys. But honestly kids don’t really need that much. Now that I am reading your post, you’re right it’s not the kids or the wardrobe that is the problem it’s the MIL. I know she means well, but she has taking in the shopping to the extreme more like a hobby. Now I am going to share your blog to all my friends and family and maybe CC: my dear Mother in Law. Colleen I really do appreciate you taking the time to blog about this, its means allot to me, especially now that I am reading it and it makes more sense to me. And all along I thought It’s was my fault because they have so much. By away I’ve stop going to the Mall and I am very happy with my decision to stop shopping, I wish I could say the same about my DH. thank you for your comment. I really do hope this post was a help to you and I wish you all the success in the world when it comes to confronting your MIL. I am sure she is a lovely lady who really means well. Please make sure you read Donna’s commment with the idea that you could suggest to your MIL to put the money towards a college fund or something your children can benifit from in the future. It must be frustrating for you to be surrounded by opposing attitudes, all I can say is keep spreading the word and worth of decluttering and simplifying. Life can be wonderful with less. I will let you all know what happen when I have a talk with her again. Conclusion to be follow. Colleen, thank you for the request formula!!! I have little tact and am too direct, or else I stuff everything down inside and explode when I can’t handle it anymore. Neither one is helpful. don’t feel alone it sounds like you and I might have similar personalities when it comes to expressing ourselves. You should get inside my head when I have to ask for a pay raise of something like that I’m hopeless. When the approach is broken down into a formula like that it doesn’t seem so scary or unreasonable so I am looking forward to practising it to build up my courage. This is a comment on an old post…but since I am reading back through the archives, someone else may as well! My kids are older now (12 and 15) but I found that at almost every age since preschool, they have had fairly strong opinions about what clothing they wanted to wear. Many items were passed down to use from older, bigger friends–which was a great money saver! However, there were some items that just always seemed to end up on the floor, then in the laundry, again and again without ever actually being worn. If an item receives a “Not THAT” more than 3 times after my suggestion to wear it to school–it really doesn’t need to be taking up space in the closet or dresser. I pass it on to a younger child, or used to donate to a local relief nursery if the clothes were in good condition.